The event started with a seven-round Swiss bracket into a top-8 cut. The top-8 players then played in two GSL-style double-elimination groups to determine the top four players who would get a spot at the global Summer Championship as representatives of the Asia-Pacific region. 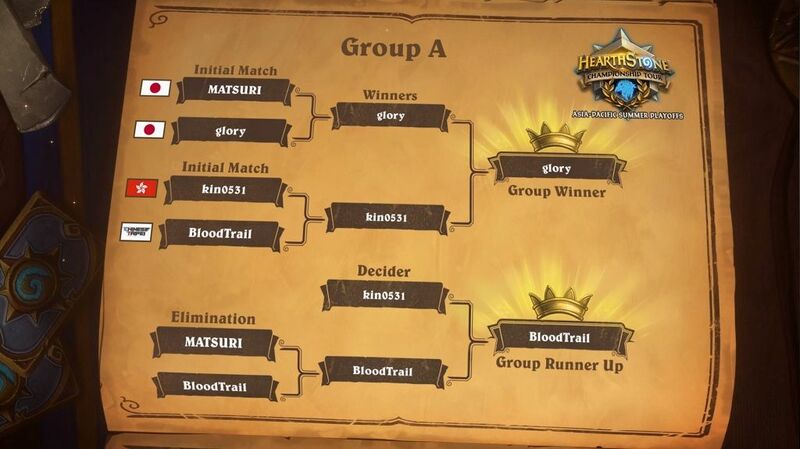 The four players who earned their invites to the Summer Championship were glory, BloodTrail, Jinsoo, and Tansoku! It took three Playoff tournaments, but Even Paladin finally found its rightful place at the top of the Witchwood food chain. 68 Paladins. Every single one of them an Even Paladin. It was the week of the Paladin – next week the archetype will be nerfed as Call to Arms becomes a 5-mana card and can no longer be used in Even Paladin. In other news, Warlock held on to the #2 spot and Druid also kept looking solid even though it was forced to share the #3 spot with Rogue now – a class that saw increase in play each Playoff week. Priest’s numbers kept going down, only surpassed by the sharp decline in Mage numbers that sank Mage below Priest. Shaman is the big comeback story of Witchwood: Even Shaman has its share of good and bad matchups, but one of its good matchups is Even Paladin, and that was enough to propel the class back to the competitive meta with 13 players out of 71 bringing Shaman. HCT APAC Playoffs saw two new archetypes enter the Playoff meta: Secret Hunter and Murloc Mage arrived, saw, and mostly left. Alkaiser could not find success with Murloc Mage, but Secret Hunter was more split: CitizenNappa piloted his lineup with Secret Hunter to a 5-2 record, missing out on top-8 on tiebreakers, whereas Ender ended up at 0-3 with the same lineup. It will be interesting to see where Hunter ends up after the nerfs go live. A number of archetypes were nowhere to be seen at APAC: Taunt Druid, Murloc Paladin, Zoolock, and Token Druid disappeared completely, giving in to the dominance of the main archetypes of their classes. The fall of Taunt Druid was a sharp one: 25 at Europe, 10 at Americas, 0 at APAC. Even Paladin was finally established as the king of the meta. 68 players brought Paladin, all of them Even Paladin. Only three players chose to not bring Paladin, and while MegaGliscor’s control lineup reached a 5-2 record and only missed out on top-8 on tiebreakers, every player in the top-8 had Even Paladin in their lineup, and the archetype won 119 of its 222 non-mirror games in Swiss for a 54% win rate. Warlock remained a common choice with 59 players bringing it, but it was no longer a class everyone was expected to bring. Perhaps it should have been, though, given that everyone in top-8 had Warlock in their lineup once again. 4 of the 40 Cubelocks and 4 of the 19 Control Warlocks made it to the top-8. Control was the way to counter the aggressive meta of the APAC Playoffs – lineups with Control Warlock in them reached a 60% match win rate in non-mirror matches in Swiss, compared to 52% reached by lineups with Cubelock in them. It is ironic that as the number of players bringing control has went down each week, the performance of the deck type has improved. As a class, Warlock won 160 of its 308 non-mirror games in Swiss and reached a 52% win rate. Unfortunately, it is not possible to pinpoint the performance of Control and Cube separately. Alongside Paladin, Druid saw players flocking to a single archetype: every one of the 48 Druid decks brought to the tournament was a Spiteful Druid. Five of them made it to the top-8, so Druid held its own in the tournament. Spiteful Druid won 172 of its 330 non-mirror games in Swiss for a 52% win rate. Rogue was used in two completely opposite strategies: 24 players brought Quest Rogue, 23 players brought Odd Rogue, and one player trusted in the good old Miracle Rogue. Looking at the non-mirror match win rates of lineups that included one of these classes, Quest Rogue looks like the top pick at 54%, followed by Miracle at 50% and Odd trailing behind at 41%. The top-8, however, included 3 Quest Rogues and 2 Odd Rogues, so the aggressive strategy also saw some success – for the top-4, two Quest Rogues made it while the Odd Rogue fell at the final stages. As a class, Rogue won 136 of its 295 non-mirror games in Swiss for a 46% win rate, but as it had archetypes that were the polar opposites of each other, this figure cannot be used to determine what Rogue decks were good ones. Priest went on a steady decline throughout the Playoffs ever since its surprising popularity in Europe. It has been a class that has done fine, but it has not exactly had a lot of shine to it. All 19 Priest players at APAC brought Mind Blast Priest, and it was once again, fine. Not great, not terrible. Three Priests reached the top-8 and two of them made it to the top-4, so in that sense the class performed well. 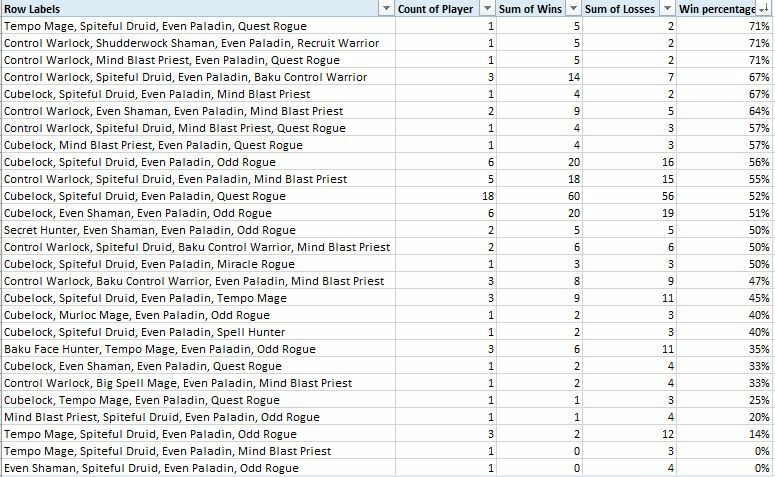 On game level, Mind Blast Priests won 72 of their 151 non-mirror games in Swiss for a 48% win rate. Mage did well in Europe but has gone downhill since then. 12 players brought Tempo Mage to APAC, one brought Big-Spell Mage, and one brought Murloc Mage. None of them made it to the top-8. Okasinnsuke was the lone success story with his 5-2 record with a unique Tempo Mage-Spiteful Druid-Even Paladin-Quest Rogue lineup, but he missed out on top-8 on tiebreakers. 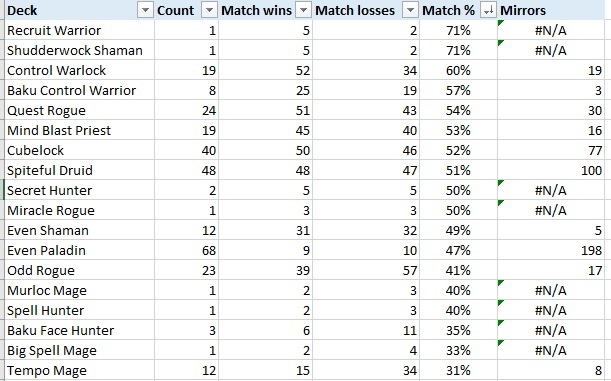 As a class, Mage was the worst one in the tournament, winning only 34 of its 92 non-mirror games in Swiss for a 37% win rate. It did not have a single matchup with more than 50% win rate. Shaman was the bright-eyed newcomer at APAC. The hints of Even Shaman performing well in the tournament meta that we saw at HCT Americas were taken seriously by a number of players, and 12 players brought Even Shaman with one player choosing to go with Shudderwock Shaman. Two Even Shamans made it to the top-8, and one of them made it all the way to the top-4! Even FroStee’s Shudderwock Shaman lineup ended 5-2 and only missed out on the top-8 on tiebreakers. Overall, Even Shaman lineups did not do too well, though. In Swiss, they reached a 49% match win rate in non-mirror matches. Shaman as a class did very well in its games, with 54 wins in 97 non-mirror games for a 56% win rate. Why is that? One distinctive feature of Even Shaman lineups is that they often also included Odd Rogue, which really struggled in the tournament. 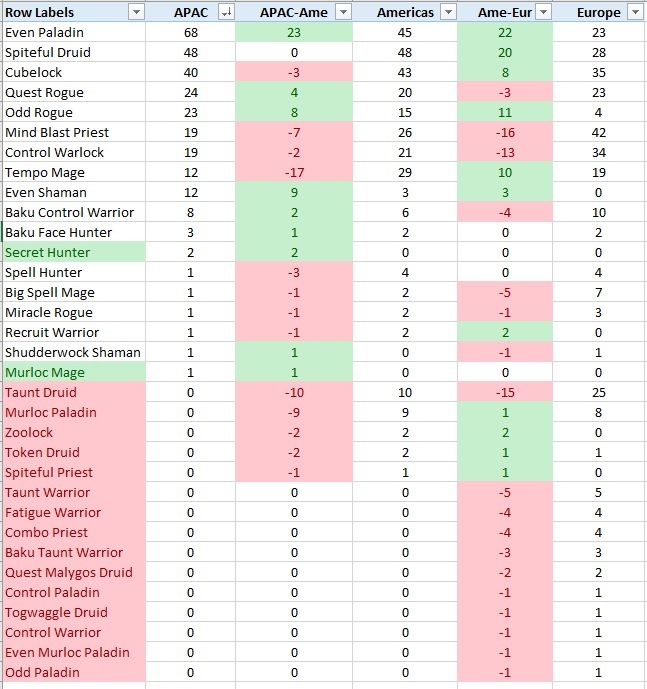 Even Shaman as part of non-Odd Rogue lineups did much better than as part of Odd Rogue lineups. The story of Shaman showcases the difficulty of evaluating decks and lineups with the statistics we have access to – with no archetype-level win-loss statistics, evaluating the performance of individual archetypes is difficult whenever a class has multiple styles of play. Warrior is another interesting showcase of evaluating decks and entire lineups. There were nine Warriors in the tournament: 8 Baku Control Warriors and 1 Recruit Warrior. One Baku Control Warrior made it all the way to the top-4 and three other Warrior lineups missed out on tiebreakers at 5-2. Warrior lineups overall were some of the best-performing lineups in the tournament. Was Warrior the best class, then? As a class, it only won 27 of its 59 non-mirror games in Swiss for a 46% win rate. That’s the second-worst in the entire tournament! However, it was good at beating Paladin, Rogue, and Priest – it was not a class with poor performance across the board, but rather one with polarized matchups, able to take the wins against its main targets. As part of a synergistic lineup, it did fine, despite winning less than half of its games. Finally, there’s Hunter. The field consisted of 3 Baku Face Hunters, 2 Secret Hunters, and 1 Spell Hunter. None of the made it to the top-8, with CitizenNappa being the sole successful player with a 5-2 record with his Secret Hunter lineup, missing out on top-8 on tiebreakers. As a class, however, Hunter won 21 of its 36 non-mirror games in the Swiss for a stunning 58% win rate. Many Hunter lineups included Tempo Mage and Odd Rogue, which did not do too well in the tournament. Here are some of the most interesting decks from the top-performing players. None of these decks will be hit by the nerfs next week! Control Warrior was part of several well-performing lineups, and Tansoku piloted this build all the way to the top-4. It’s a removal-heavy build with King Mosh, double silence, and double weapon removal. There is no Azalina to fight against Control Warlock and Priest, but Control Warlock and Priest did not turn out to be very popular in the tournament anyway. Glory piloted Even Shaman all the way to the top-4 and the Summer Championship. His take was very similar to what SwaggyG brought to Americas Playoffs one week earlier: one Stormforged Axe had made way for an Acidic Swamp Ooze, other than that it was the exact same build. Grab the board, never let go, win. That’s the Even Shaman game plan in a nutshell. There are limited ways to come back to a game, Hagatha mostly, so it’s better to just win the tempo game in the first place. There were a few different Mind Blast Priest lists in the tournament: Scaleworm builds were the most common, but Lifedrinker builds, Squashling builds, and Twilight Acolyte builds also made an appearance. Jinsoo piloted this Twilight Acolyte + Cabal Shadow Priest list all the way to the top-4, stealing minions as he went on. FroStee brought a newer type of Shudderwock Shaman build to the tournament, with a build I could not find from the HSReplay database. The style itself is well-known by now: a Keleseth build that can fight for the board and does not run the full Shudderwock OTK combo, but can still use Shudderwock as a threatening resource. FroStee’s build is slightly closer to the OTK build that many of these lists, as he is only missing Murmuring Elemental and Fire Plume Harbinger – he has all the copy and damage pieces, so when he gets to Shudderwock, there is a chance that he can get extra copies back to hand for the OTK. You can go face without Baku too. CitizenNappa piloted his lineup with this very aggressive Secret Hunter deck to a 5-2 score in Swiss. Not running Baku gives access to Crackling Razormaw, Hunter Secrets, and the powerful Emerald Spellstone.